Usage: To delivers a spray of water. With the assistance of our skilled professionals, we are offering a quality tested array of Grohe Tap to our valuable clients. 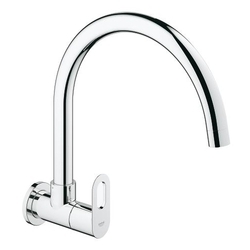 Our Grohe Tap is available in varied models to meet the different demands of the clients. They give trouble free performance to the user as they are stringently tested on different quality parameters. 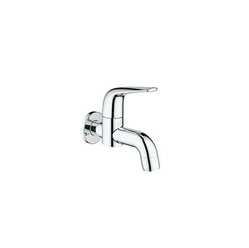 We are renowned organizations of market for presenting the optimum quality range of Basin Taps. GROHE is the leading faucet manufacturer in the world, and the market leader in Europe. GROHE is known for exclusivity in their designs with the most sophisticated features like hand ground bodies, Nickel-plated Brass castings, 23-Carat scratch resistant Gold finishes and Crystal handles. GROHE has built its worldwide success on an undisputed reputation for quality and technical innovation. Digitecture is the latest addition to the Grohe Ondus Digital Faucet Collection: everything you need for the bathroom on a single, slim, wall-mounted panel including temperature control, touch pad operation, a sleek faucet and holders for soap and cups. Environmentally friendly, the Ondus Digitecture adjust the water to the perfect temperature to avoid wastefully running water.